The recipe on page 15 of Around My French Table for Mustard Batons was one of the first recipes in Dorie Greenspan’s new book that caught my eye. 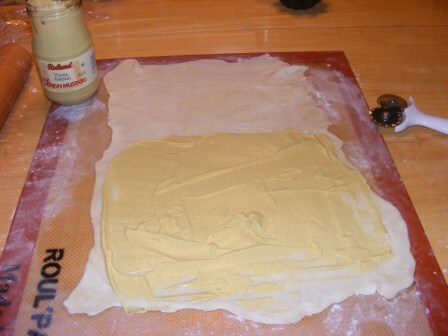 It’s a very simple recipe: puff pastry and Dijon mustard are the main ingredients. It looked like a recipe that could be thrown together and in the oven in less than 10 minutes, making it perfect for a quick appetizer or a simple weeknight snack. Dorie’s recipe calls for frozen puff pastry. However, as noted in a previous post, I had been wanting to try Nick Malgieri‘s Instant Puff Pastry recipe, and this seemed like a good reason to give it a go. You can read about my puff pastry making adventure here. Suffice it to say, if you are still buying frozen puff pastry, you really should give making it a try. You won’t believe how easy it is, and how great the results are. With my puff pastry in the refrigerator, and a strong Dijon mustard in the cupboard, I was ready to put together some Mustard Bâtons. I began by setting the chilled puff pastry on a lightly floured board, then hitting it with a French rolling pin to soften it and begin flattening it out a bit. 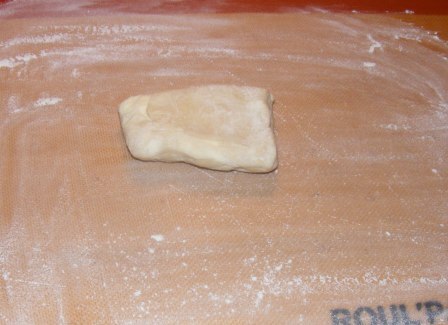 I then rolled the pastry, giving it several 90° turns and flipping it over from time to time, until I had a 12 x 16 rectangle. I turned the dough so one of the short sides was toward me, then spread the lower half with Dijon mustard. After folding down the top half of the dough, I pressed it lightly to seal it. 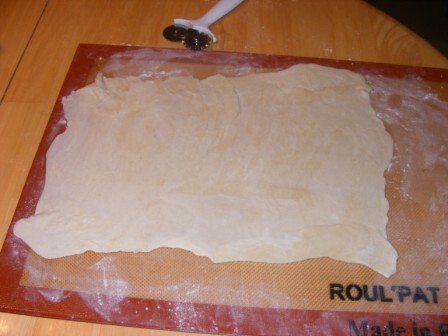 Then I used my pastry wheel to cut the dough into one-inch strips. 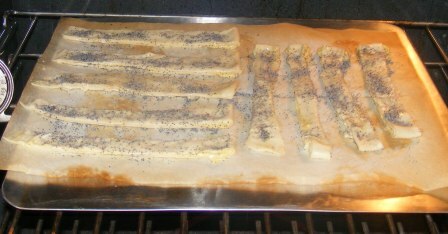 After I put the strips on the pan, I brushed them with egg, then sprinkled them with poppy seeds. The bâtons baked in a 400° oven for about 15 minutes, until they were puffed and golden brown. The house smelled so good while the bâtons were baking. The puff pastry smelled rich and buttery, and the Dijon had a pleasant pungent aroma. I allowed the bâtons to cool for a few minutes before digging into them. They tasted as good as they smelled. My wife found the Dijon a bit too strong, but I really enjoyed the sharp edge of the mustard combined with the flaky puff pastry. This is another recipe to make again and again. Dorie suggests making them ahead and freezing them before baking, but they are so quick and easy to throw together (especially with homemade puff pastry in the freezer), that I think I will normally make and bake them on the same day. Your batons look so good! I definitely need to look into making my own puff pastry. I have to admit I just made mine now (a couple of days later) and haven’t done my post yet. I did sprinkle the tops with coarse salt because I wanted to get that ‘pretzel-y’ feel. Love that you made your own puff pastry!!!!! You give me courage to try it myself sometime. Your batons look great. Thanks. I made puff pastry using Nick’s super-simple recipe before I knew how much work a traditional recipe was. I’ve made croissants the old-fashioned way, but never puff pastry. Good for you – these must have tasted wonderful! very impressed that you did these with your own puff!–i bet they were fantastic! Thanks, they really were delicious. And I love the homemade puff pastry. So easy and good. I’ve never made puff pastry, that’s fantastic! Your batons turned out great. Thanks. They were definitely a big hit around here. Your puff pastry worked out wonderfully – your bâtons look beautiful! I’ve been seeing a number of posts that used this puff pastry recipe – I think I’ll have to try converting it to gluten-free and see if it outshines the one I used. I’d be interested to hear how it works out. I am so impressed that you made your own puff pastry ! This was really neat to hear because I never would have considered attempting this one from scratch. Nana and I had a blast with these and each enjoyed the ease (we used frozen pastry :), the taste and the appearance. We will each be revisiting this recipe many times. Even making your own puff pastry, this recipe is super easy. Like others, I’m impressed you made your own puff pastry. I’ve always been afraid to try, but you’re inspiring me. Your batons look gorgeous. I cut mine in half, but they look so elegant full length. Great job! Thanks. You should give it a try! so impressed that you made your puff pastry! looks beautiful. Delicious ! I wish I had some more in the freezer ! Well you certainly gave this ‘recipe’ legitimacy by making the puff pastry too! You win!!! They look yummy! Kudos to you for making your own pastry. I loved these. I enjoyed your puff pastry making experience as well; I’ve made my own several times and it is simplicity itself, like a pie dough that you fold over like a letter 6 times. (But, frozen can be very good also!) I enjoy your blog. Thanks. I hadn’t worked much with puff pastry before making my own. Now I almost always have some in the freezer. I love that you made your own puff pastry. I’m going to have to try that some day!! 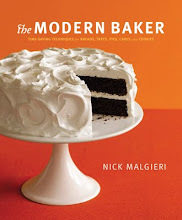 You should try to get a copy on Nick’s recipe. It’s really easy and turns out great every time. Your batons look great! Extra kudos for making your own pastry. Great job…I’m impressed that you made your puff pastry. Your batons turned out really well. I’m inspired to make my own dough next time. With Nick Malgieri’s recipe, puff pastry is surprisingly easy to make. And it turns out so good. These batons look so good!! I tried Nick Malgieri’s super-quick puff pastry too, isn’t it amazing? Do you like your roulpat? Can you cut on it? I’ve been thinking of adding it to my Christmas list, but am unsure. Nice job!! Renee, I love my Roul-pat. You’re not supposed to cut on it, but I cut on it with bench blades, pizza wheels, and pastry cutters all the time. That and my Silpats are among my favorite kitchen tools. Your batons look beautiful. Why don’t you think about making a different baton-filling for your wife? Tapenade or herb butter or even butter and seaweed flakes. Or make them sweet and fill them with jam. This is a recipe I know you’ll have fun playing around with. 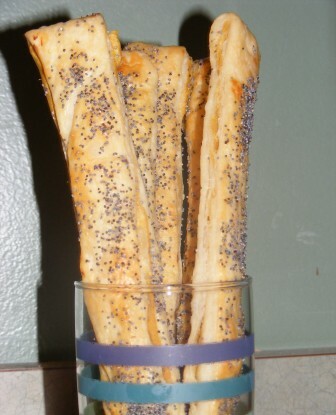 Jam-filled batons sound delightful. I was thinking tepenade or pesto, too. Oh, these look fun and interesting. We are big mustard fans here…all of us! I think I counted 14 different jars of mustard currently active in the frig. Can’t wait to try this. Thanks for the process photos…it really does seem easy. They are so simple and delicious. If you have puff pastry (store bought or homemade) in the freezer, you could whip these up anytime in no time flat.